After Weber's immense productivity in the early 1890s, he did not publish any papers between early 1898 and late 1902, finally resigning his professorship in late 1903. Freed from those obligations, in that year he accepted a position as associate editor of the Archives for Social Science and Social Welfare, where he worked with his colleagues Edgar Jaffé [de] and Werner Sombart. His new interests would lie in more fundamental issues of social sciences; his works from this latter period are of primary interest to modern scholars. In 1904, Weber began to publish some of his most seminal papers in this journal, notably his essay The Protestant Ethic and the Spirit of Capitalism, which became his most famous work and laid the foundations for his later research on the impact of cultures and religions on the development of economic systems. This essay was the only one of his works from that period that was published as a book during his lifetime. Some other of his works written in the first one and a half decades of the 20th century—published posthumously and dedicated primarily from the fields of sociology of religion, economic and legal sociology—are also recognised as among his most important intellectual contributions. In Weber's critique of the left, he complained of the leaders of the leftist Spartacus League—which was led by Karl Liebknecht and Rosa Luxemburg and controlled the city government of Berlin while Weber was campaigning for his party—"We have this [German] revolution to thank for the fact that we cannot send a single division against the Poles. All we see is dirt, muck, dung, and horse-play—nothing else. Liebknecht belongs in the madhouse and Rosa Luxemburg in the zoological gardens." Weber was at the same time critical of the Versailles Treaty, which he believed unjustly assigned "war guilt" to Germany when it came to World War I. Weber believed that many countries were guilty of starting World War I, not just Germany. In making this case, Weber argued that "In the case of this war there is one, and only one power that desired it under all circumstances through its own will and, according to their political goals required: Russia. ... It never crossed [my] mind that a German invasion of Belgium [in 1914] was nothing but an innocent act on the part of the Germans." Weber notes that these three aspects "...constitute the essence of bureaucratic administration ... in the public sector. In the private sector, these three aspects constitute the essence of a bureaucratic management of a private company." New research suggests that some of Weber's theories, including his interest in the sociology of Far Eastern religion and elements of his theory of disenchantment, were actually shaped by Weber's interaction with contemporary German occult figures. He is known to have visited the Ordo Templi Orientis at Monte Verità shortly before articulating his idea of disenchantment. :269–70 He is known to have met the German poet and occultist Stefan George and developed some elements of his theory of charisma after observing George. However, Weber disagreed with many of George's views and never formally joined George's occult circle. :290–93 Weber may have also had his first exposure to Taoism, albeit in a Westernized form, through Gustav Gräser at Monte Verità. :275–76 Research on Weber's engagement with the occult has led some German and American scholars[who?] to re-interpret his theories of disenchantment. There is no absolutely "objective" scientific analysis of culture. ... All knowledge of cultural reality ... is always knowledge from particular points of view. ... an "objective" analysis of cultural events, which proceeds according to the thesis that the ideal of science is the reduction of empirical reality to "laws", is meaningless ... [because] ... the knowledge of social laws is not knowledge of social reality but is rather one of the various aids used by our minds for attaining this end. Features of rationalisation include increasing knowledge, growing impersonality and enhanced control of social and material life. Weber was ambivalent towards rationalisation; while admitting it was responsible for many advances, in particular, freeing humans from traditional, restrictive and illogical social guidelines, he also criticised it for dehumanising individuals as "cogs in the machine" and curtailing their freedom, trapping them in the bureaucratic iron cage of rationality and bureaucracy. Related to rationalisation is the process of disenchantment, in which the world is becoming more explained and less mystical, moving from polytheistic religions to monotheistic ones and finally to the Godless science of modernity. However, another interpretation of Weber's theory of disenchantment, advanced by historian of religion Jason Josephson-Storm, claims that Weber does not envision a binary between rationisation and magical thinking, and that Weber actually referred to the sequestering and professionalisation of magic when he described disenchantment, not to the disappearances of magic. :299–300 Regardless, for Weber the processes of rationalisation affect all of society, removing "sublime values ... from public life" and making art less creative. Weber's essay The Protestant Ethic and the Spirit of Capitalism is his most famous work. It is argued[by whom?] that this work should not be viewed as a detailed study of Protestantism, but rather as an introduction into Weber's later works, especially his studies of interaction between various religious ideas and economic behaviour as part of the rationalisation of the economic system. 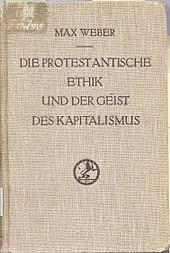 In The Protestant Ethic and the Spirit of Capitalism, Weber put forward the thesis that Calvinist ethic and ideas influenced the development of capitalism. He noted the post-Reformation shift of Europe's economic centre away from Catholic countries such as France, Spain and Italy, and toward Protestant countries such as the Netherlands, England, Scotland and Germany. Weber also noted that societies having more Protestants were those with a more highly developed capitalist economy. Similarly, in societies with different religions, most successful business leaders were Protestant. Weber thus argued that Roman Catholicism impeded the development of the capitalist economy in the West, as did other religions such as Confucianism and Buddhism elsewhere in the world. Weber's death in 1920 prevented him from following his planned analysis of Psalms, the Book of Job, Talmudic Jewry, early Christianity and Islam. The concept of theodicy was expanded mainly with the thought of Weber and his addition of ethical considerations to the subject of religion. There is this ethical part of religion, including, "...(1) soteriology and (2) theodicy. These mean, respectively, how people understand themselves to be capable of a correct relationship with supernatural powers, and how to explain evil—or why bad things seem to happen to those who seem to be good people." There is a separation of different theodicies with regard to class. "Theodicies of misfortune tend to the belief that wealth and other manifestations of privilege are indications or signs of evil. ... In contrast, theodicies of fortune emphasise the notion that privileges are a blessing and are deserved." Weber also writes that, "The affluent embrace good fortune theodicies, which emphasise that prosperity is a blessing of God ... [while] theodices of misfortune emphasise that affluence is a sign of evil and that suffering in this world will be rewarded in the next." Thus these two distinctions can be applied not only to class structure within society but denomination and racial segregation within religion. The origin of a rational and inner-worldly ethic is associated in the Occident with the appearance of thinkers and prophets ... who developed in a social context that was alien to the Asiatic cultures. This context consisted of the political problems engendered by the bourgeois status-group of the city, without which neither Judaism, nor Christianity, nor the development of Hellenistic thinking are conceivable. In order to make possible a rational utilisation of the means of production, a system of in-kind accounting would have to determine "value"—indicators of some kind for the individual capital goods which could take over the role of the "prices" used in book valuation in modern business accounting. But it is not at all clear how such indicators could be established and in particular, verified; whether, for instance, they should vary from one production unit to the next (on the basis of economic location), or whether they should be uniform for the entire economy, on the basis of "social utility", that is, of (present and future) consumption requirements ... Nothing is gained by assuming that, if only the problem of a non-monetary economy were seriously enough attacked, a suitable accounting method would be discovered or invented. The problem is fundamental to any kind of complete socialisation. We cannot speak of a rational "planned economy" so long as in this decisive respect we have no instrument for elaborating a rational "plan". [Sociology is] the science whose object is to interpret the meaning of social action and thereby give a causal explanation of the way in which the action proceeds and the effects which it produces. By "action" in this definition is meant the human behaviour when and to the extent that the agent or agents see it as subjectively meaningful ... the meaning to which we refer may be either (a) the meaning actually intended either by an individual agent on a particular historical occasion or by a number of agents on an approximate average in a given set of cases, or (b) the meaning attributed to the agent or agents, as types, in a pure type constructed in the abstract. In neither case is the "meaning" to be thought of as somehow objectively "correct" or "true" by some metaphysical criterion. This is the difference between the empirical sciences of action, such as sociology and history and any kind of a priori discipline, such as jurisprudence, logic, ethics, or aesthetics whose aim is to extract from their subject-matter "correct" or "valid" meaning. Many scholars, however, disagree with specific claims in Weber's historical analysis. For example, the economist Joseph Schumpeter argued that capitalism did not begin with the Industrial Revolution but in 14th century Italy. In Milan, Venice and Florence, the small city-state governments led to the development of the earliest forms of capitalism. In the 16th century, Antwerp was a commercial centre of Europe. Also, the predominantly Calvinist country of Scotland did not enjoy the same economic growth as the Netherlands, England and New England. It has been pointed out that the Netherlands, which had a Calvinist majority, industrialised much later in the 19th century than predominantly Catholic Belgium, which was one of the centres of the Industrial Revolution on the European mainland. Emil Kauder expanded Schumpeter's argument, by arguing the hypothesis that Calvinism hurt the development of capitalism by leading to the development of the labour theory of value. Weber wrote in German. Original titles printed after his death (1920) are most likely compilations of his unfinished works (of the Collected Essays ... form). Many translations are made of parts or sections of various German originals and the names of the translations often do not reveal what part of German work they contain. Weber's work is generally quoted according to the critical Max Weber-Gesamtausgabe (Collected Works edition), which is published by Mohr Siebeck in Tübingen. ^ Bellamy, Richard (1992), Liberalism and Modern Society, Polity, p. 165 . 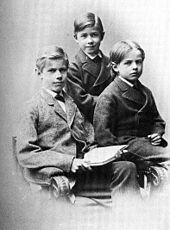 ^ a b Mommsen, Wolfgang J. (2013). Max Weber and His Contempories. Routledge. pp. 8–10. ^ Bendix, Reinhard; Roth, Guenther (1971), Scholarship and Partisanship: Essays on Max Weber, University of California Press, p. 244, ISBN 978-0520041714 . ^ "Max Weber", Encyclopædia Britannica (online ed. ), 20 April 2009 . ^ a b c d e f g h i j k l m n o p q r s t u v w x y z aa ab ac ad ae af ag ah ai aj ak al am an ao ap aq ar as at au av aw ax Kim, Sung Ho (2007). "Max Weber". Encyclopaedia of Philosophy. Stanford. Retrieved 17 February 2010. ^ a b Max Weber; Hans Heinrich Gerth; Bryan S. Turner (1991). From Max Weber: essays in sociology. Psychology Press. p. 1. ISBN 978-0-415-06056-1. Retrieved 22 March 2011. ^ Radkau, Joachim and Patrick Camiller (2009). Max Weber: A Biography. Trans. Patrick Camiller. Polity Press. ISBN 978-0-74564147-8. ^ Giddens, Anthony (1971). Capitalism and Modern Social Theory: an Analysis of the Writings of Marx, Durkheim and Max Weber. Cambridge University Press. ISBN 978-0-52109785-7. ^ Auguste Comte, Marx and Weber: Benton, Ted (1977). Philosophical Foundations of the Three Sociologies. London: Rout-ledge & Kegan Paul. ISBN 978-0-71008593-1. ^ Tiryakian, Edward A. (2009). For Durkheim: Essays in Historical and Cultural Sociology. Routledge. p. 321. ISBN 978-0-75467155-8. ^ a b Habermas, Jürgen, The Philosophical Discourse of Modernity (originally published in German in 1985), Polity Press (1990), ISBN 0-7456-0830-2, p. 2. ^ Macionis, John J. (2012). Sociology (14th ed.). Boston: Pearson. p. 88. ISBN 978-0-205-11671-3. ^ Weber, Max The Protestant Ethic and "The Spirit of Capitalism" (1905). Transl. by Stephen Kalberg (2002), Roxbury Publ. Co., pp. 19, 35; Weber's references on these pages to "Superstructure" and "base" are unambiguous references to Marxism's base/superstructure theory. ^ Sica, Alan (2004). Max Weber and the New Century. London: Transaction Publishers, p. 24. ISBN 0-7658-0190-6. ^ a b c d e f g Craig J. Calhoun (2002). Classical sociological theory. Wiley-Blackwell. p. 165. ISBN 978-0-631-21348-2. Retrieved 19 March 2011. ^ a b Dirk Käsler (1988). Max Weber: an introduction to his life and work. University of Chicago Press. p. 2. ISBN 978-0-226-42560-3. Retrieved 24 March 2011. ^ McKinnon, AM (2010), "Elective affinities of the Protestant ethic: Weber and the chemistry of capitalism" (PDF), Sociological Theory, 28 (1): 108–26, doi:10.1111/j.1467-9558.2009.01367.x . ^ a b George Ritzer (2009). Contemporary Sociological Theory and Its Classical Roots: The Basics. McGraw-Hill. p. 32. ISBN 978-0-07-340438-7. Retrieved 22 March 2011. ^ Bendix, Reinhard (1977). Max Weber: An Intellectual Portrait. University of California Press. p. 1. ISBN 978-0-520-03194-4. ^ a b Allan, Kenneth D. (2005). Explorations in Classical Sociological Theory: Seeing the Social World. Pine Forge Press. p. 146. ISBN 978-1-4129-0572-5. ^ Weber, Max. Political Writings. Cambridge University Press, 1994, p. ix. ^ a b c d Bendix (1977). Max Weber. p. 2. ISBN 978-0-520-03194-4. ^ a b c d e Ludwig M. Lachmann (1970). The legacy of Max Weber. Ludwig von Mises Institute. p. 143. ISBN 978-1-61016-072-8. Retrieved 22 March 2011. ^ a b Gianfranco Poggi (2006). Weber: a short introduction. Polity. p. 5. ISBN 978-0-7456-3489-0. Retrieved 22 March 2011. ^ Wolfgang Justin Mommsen (1984). 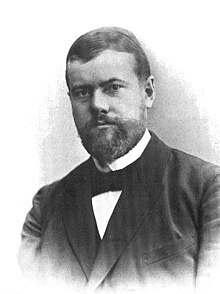 Max Weber and German Politics, 1890–1920. University of Chicago Press. p. 19. ISBN 978-0-226-53399-5. ^ Wolfgang J. Mommsen; Michael Steinberg (1990). Max Weber and German Politics, 1890–1920. University of Chicago Press. pp. 54–56. ISBN 978-0-226-53399-5. Retrieved 22 March 2011. ^ Eric J. Hobsbawm (1987). The age of empire, 1875–1914. Pantheon Books. p. 152. ISBN 978-0-394-56319-0. Retrieved 22 March 2011. ^ Weber, Max. Political Writings. University of Cambridge Press, 1994. pp. 1–28. ^ Marianne Weber. Last accessed on 18 September 2006. Based on Lengermann, P.; Niebrugge-Brantley, J. (1998). The Women Founders: Sociology and Social Theory, 1830–1930. Boston: McGraw-Hill. ISBN 978-0-07-037169-9. ^ Hartmut Lehmann; Guenther Roth (1995). Weber's Protestant Ethic: Origins, Evidence, Contexts. Cambridge University Press. p. 95. ISBN 978-0-521-55829-7. Retrieved 24 March 2011. ^ Paul Honigsheim; Alan Sica (2003). The unknown Max Weber. Transaction Publishers. p. 86. ISBN 978-0-7658-0953-7. Retrieved 24 March 2011. ^ a b c d e Craig J. Calhoun (2002). Classical sociological theory. Wiley-Blackwell. p. 166. ISBN 978-0-631-21348-2. Retrieved 19 March 2011. ^ Max Weber; Richard Swedberg (1999). Essays in economic sociology. Princeton University Press. p. 7. ISBN 978-0-691-00906-3. Retrieved 22 March 2011. ^ "Why Work?". The New Yorker. 22 November 2004. Retrieved 25 September 2014. ^ a b c d e Bendix (1977). Max Weber. p. 3. ISBN 978-0-520-03194-4. ^ Roth, Guenther (1979). "History and Sociology in the Work of Max Weber". British Journal of Sociology. 27 (3): 306–18. doi:10.2307/589618. JSTOR 589618. ^ a b Max Weber; Richard Swedberg (1999). Essays in economic sociology. Princeton University Press. p. 22. ISBN 978-0-691-00906-3. Retrieved 22 March 2011. ^ Iannaccone, Laurence (1998). "Introduction to the Economics of Religion". Journal of Economic Literature. 36 (3): 1465–96. JSTOR 2564806. ^ Michael Wise, "Max Weber Visits America: A Review of the Video," Sociation Today, volume 4, number 2, Fall 2006. ^ Gerth, H.H; Mills, C. Wright (1948), From Max Weber: Essays in Sociology, London: Routledge, ISBN 978-0-415-17503-6 . ^ Sven Eliaeson, "Constitutional Caesarism: Weber's Politics in their German Context", in Turner, Stephen (ed) (2000). The Cambridge Companion to Weber. Cambridge: Cambridge University Press, p. 142. ^ P.G.C. van Schie; Gerrit Voermann (2006). The dividing line between success and failure: a comparison of liberalism in the Netherlands and Germany in the 19th and 20th centuries. LIT Verlag Münster. p. 64. ISBN 978-3-8258-7668-5. Retrieved 22 March 2011. ^ Radkau, Joachim (2009), Max Weber, A Biography, New York: Polity Press, p. 209 . ^ Waters & Waters 2015, p. 20. ^ Waters & Waters 2015, pp. 21, 196. ^ James W. Fesler. (1965). "Bureaucratic Phenomena". Administrative Science Quarterly, Volume 10, September 1965, p. 163. ^ Frisby, David (2002). Georg Simmel. Key Sociologists (Second ed.). London: Routledge. ISBN 978-0-415-28535-3. ^ Weber, Max. Political Writings. Cambridge University Press, 1994, p. 288. ^ H.H. Gerth and C.W. Mills, "A Biographical View" in From Max Weber: Essays in Sociology. ^ Mittleman, Alan (1999). "Leo Strauss and Relativism: the Critique of Max Weber". Religion. 29: 15–27. doi:10.1006/reli.1999.0176. ^ a b Richard Swedberg, "Max Weber as an Economist and as a Sociologist: Towards a Fuller Understanding of Weber's View of Economics – Critical Essay Archived 30 April 2011 at the Wayback Machine", American Journal of Economics and Sociology, (1999). ^ a b c d Josephson-Storm, Jason (2017). The Myth of Disenchantment: Magic, Modernity, and the Birth of the Human Sciences. University of Chicago Press. ISBN 978-0-226-40336-6. ^ Allan, Kenneth D. (2005). Explorations in Classical Sociological Theory: Seeing the Social World. Pine Forge Press. p. 144. ISBN 978-1-4129-0572-5. ^ a b c Allan, Kenneth D. (2005). Explorations in Classical Sociological Theory: Seeing the Social World. Pine Forge Press. p. 148. ISBN 978-1-4129-0572-5. ^ Robert B. Denhardt (2010). Theories of Public Organization. Cengage Learning. p. 27. ISBN 978-1-4390-8623-0. Retrieved 14 April 2011. ^ a b George Ritzer (2009). Contemporary Sociological Theory and Its Classical Roots: The Basics. McGraw-Hill. p. 31. ISBN 978-0-07-340438-7. Retrieved 22 March 2011. ^ Allan, Kenneth D. (2005). Explorations in Classical Sociological Theory: Seeing the Social World. Pine Forge Press. p. 149. ISBN 978-1-4129-0572-5. ^ a b Allan, Kenneth D. (2005). Explorations in Classical Sociological Theory: Seeing the Social World. Pine Forge Press. p. 153. ISBN 978-1-4129-0572-5. ^ a b Craig J. Calhoun (2002). Classical sociological theory. Wiley-Blackwell. p. 167. ISBN 978-0-631-21348-2. Retrieved 19 March 2011. ^ George Ritzer (2009). Contemporary Sociological Theory and Its Classical Roots: The Basics. McGraw-Hill. p. 30. ISBN 978-0-07-340438-7. Retrieved 22 March 2011. ^ a b Allan, Kenneth D. (2005). Explorations in Classical Sociological Theory: Seeing the Social World. Pine Forge Press. p. 151. ISBN 978-1-4129-0572-5. ^ Basit Bilal Koshul (2005). The postmodern significance of Max Weber's legacy: disenchanting disenchantment. Macmillan. p. 11. ISBN 978-1-4039-6784-8. Retrieved 23 March 2011. ^ a b c Bendix (1977). Max Weber. pp. 60–61. ISBN 978-0-520-03194-4. ^ a b c d Allan, Kenneth D. (2005). Explorations in Classical Sociological Theory: Seeing the Social World. Pine Forge Press. p. 162. ISBN 978-1-4129-0572-5. ^ Andrew J. Weigert (1991). Mixed emotions: certain steps toward understanding ambivalence. SUNY Press. p. 110. ISBN 978-0-7914-0600-7. Retrieved 22 March 2011. ^ a b c d e George Ritzer (2009). Contemporary Sociological Theory and Its Classical Roots: The Basics. McGraw-Hill. pp. 38–42. ISBN 978-0-07-340438-7. Retrieved 22 March 2011. ^ Allan, Kenneth D. (2005). Explorations in Classical Sociological Theory: Seeing the Social World. Pine Forge Press. p. 177. ISBN 978-1-4129-0572-5. ^ Allan, Kenneth D. (2005). Explorations in Classical Sociological Theory: Seeing the Social World. Pine Forge Press. pp. 151–52. ISBN 978-1-4129-0572-5. ^ Bendix (1977). Max Weber. p. 285. ISBN 978-0-520-03194-4. ^ a b c d Bendix (1977). "IX: Basic Concepts of Political Sociology". Max Weber. ISBN 978-0-520-03194-4. ^ Allan, Kenneth D. (2005). Explorations in Classical Sociological Theory: Seeing the Social World. Pine Forge Press. p. 154. ISBN 978-1-4129-0572-5. ^ Allan, Kenneth D. (2005). Explorations in Classical Sociological Theory: Seeing the Social World. Pine Forge Press. p. 155. ISBN 978-1-4129-0572-5. ^ Allan, Kenneth D. (2005). Explorations in Classical Sociological Theory: Seeing the Social World. Pine Forge Press. p. 158. ISBN 978-1-4129-0572-5. ^ a b c d e f g h George Ritzer (2009). Contemporary Sociological Theory and Its Classical Roots: The Basics. McGraw-Hill. pp. 35–37. ISBN 978-0-07-340438-7. Retrieved 22 March 2011. ^ Bendix (1977). Max Weber. p. 57. ISBN 978-0-520-03194-4. ^ Bendix. Max Weber. p. 54. ^ a b c d e f George Ritzer (2009). Contemporary Sociological Theory and Its Classical Roots: The Basics. McGraw-Hill. pp. 37–38. ISBN 978-0-07-340438-7. Retrieved 22 March 2011. ^ Bendix (1977). Max Weber. p. 49. ISBN 978-0-520-03194-4. ^ Richard Swedberg; Ola Agevall (2005). The Max Weber dictionary: key words and central concepts. Stanford University Press. p. 310. ISBN 978-0-8047-5095-0. Retrieved 22 March 2011. ^ Max Weber, The Religion of China, New York: Free Press, 1968. ^ a b Bendix (1977). Max Weber. pp. 98–99. ISBN 978-0-520-03194-4. ^ a b c d e Bendix (1977). Max Weber. pp. 135–41. ISBN 978-0-520-03194-4. ^ Bendix (1977). Max Weber. pp. 142–58. ISBN 978-0-520-03194-4. ^ a b c d e f Bendix (1977). Max Weber. p. 199. ISBN 978-0-520-03194-4. ^ Reinhard Bendix (1977). Max Weber: an intellectual portrait. University of California Press. p. 90. ISBN 978-0-520-03194-4. Retrieved 5 April 2011. ^ a b c Bendix (1977). Max Weber. pp. 200–01. ISBN 978-0-520-03194-4. ^ Bendix (1977). Max Weber. pp. 204–05. ISBN 978-0-520-03194-4. ^ a b c Plye, Davidson, Ralph, James. "Stratification". Encyclopedia of Religion and Society. Retrieved 27 May 2012. ^ a b Daniel Warner (1991). An ethic of responsibility in international relations. Lynne Rienner Publishers. pp. 9–10. ISBN 978-1-55587-266-3. Retrieved 5 April 2011. ^ Phelps, Martha Lizabeth (December 2014). "Doppelgangers of the State: Private Security and Transferable Legitimacy". Politics & Policy. 42 (6): 824–49. doi:10.1111/polp.12100. ^ a b c Randal Marlin (2002). Propaganda and the ethics of persuasion. Broadview Press. p. 155. ISBN 978-1-55111-376-0. Retrieved 5 April 2011. ^ Wolfgang J. Mommsen (1992). The Political and Social Theory of Max Weber: Collected Essays. University of Chicago Press. p. 46. ISBN 978-0-226-53400-8. Retrieved 22 March 2011. ^ Bendix (1977). Max Weber. p. 296. ISBN 978-0-520-03194-4. ^ Bendix (1998). Max Weber. pp. 303–05. ISBN 978-0-415-17453-4. ^ a b c d e f Richard Swedberg; Ola Agevall (2005). The Max Weber dictionary: key words and central concepts. Stanford University Press. pp. 18–21. ISBN 978-0-8047-5095-0. Retrieved 23 March 2011. ^ Marshall Sashkin; Molly G. Sashkin (2003). Leadership that matters: the critical factors for making a difference in people's lives and organisations' success. Berrett-Koehler Publishers. p. 52. ISBN 978-1-57675-193-0. Retrieved 22 March 2011. ^ a b Liesbet Hooghe (2001). The European Commission and the integration of Europe: images of governance. Cambridge University Press. p. 40. ISBN 978-0-521-00143-4. Retrieved 23 March 2011. ^ a b c d Allan, Kenneth D. (2005). Explorations in Classical Sociological Theory: Seeing the Social World. Pine Forge Press. pp. 172–76. ISBN 978-1-4129-0572-5. ^ a b Bendix (1977). Max Weber. pp. 85–87. ISBN 978-0-520-03194-4. ^ Max Weber, "The Distribution of Power Within the Gemeinschaft: Classes, Staende, Parties" pp. 59–72 in Weber's Rationalism and Modern Society, edited and translated by Tony Waters and Dagmar Waters. ^ Quoted in Bendix, Reinhard (1977). Max Weber: An Intellectual Portrait. University of California Press. p. 79. ISBN 978-0-520-03194-4. ^ Richard Swedberg; Ola Agevall (2005). The Max Weber dictionary: key words and central concepts. Stanford University Press. p. 283. ISBN 978-0-8047-5095-0. Retrieved 30 October 2011. ^ Richard Swedberg; Ola Agevall (2005). The Max Weber dictionary: key words and central concepts. Stanford University Press. pp. 64–65. ISBN 978-0-8047-5095-0. Retrieved 30 October 2011. ^ a b Schweitzer, Arthur (1975). "Frank Knight's Social Economics". History of Political Economy. 7 (3): 279–92. doi:10.1215/00182702-7-3-279. ^ Stigler, George (1950). "The Development of Utility Theory". The Journal of Political Economy. 58 (5): 373–96. doi:10.1086/256980. JSTOR 1825710. ^ Mass, Harro (2009). "Disciplining Boundaries: Lionel Robbins, Max Weber, and the Borderlands of Economics, History, and Psychology". Journal of the History of Economic Thought. 31 (4): 500. doi:10.1017/S1053837209990289. ^ Weber, Max. Selections in Translation. Trans. Eric Matthews. Ed. W.G. Runciman. Cambridge: Cambridge University Press. "Urbanisation and Social Structure in the Ancient World", pp. 290–314. ^ Ross B. Emmett (2005). Frank Knight and the Chicago School in American Economics. Routledge. pp. 111–23. ISBN 9780415775007. Retrieved 1 April 2011. ^ Richard Swedberg; Ola Agevall (2005). The Max Weber dictionary: key words and central concepts. Stanford University Press. pp. 22–23. ISBN 978-0-8047-5095-0. Retrieved 22 March 2011. ^ a b c d Keith Tribe (1995). Strategies of Economic Order: German Economic Discourse, 1750–1950. Cambridge University Press. pp. 140–68. ISBN 978-0-521-61943-1. Retrieved 30 March 2011. ^ a b Jordi Cat, "Political Economy: Theory, Practice, and Philosophical Consequences", supplement to "Otto Neurath", Stanford Encyclopedia of Philosophy (Fall 2010 Edition). ^ Max Weber, Economy and Society: An Outline of Interpretive Sociology, Guenther Roth and Claus Wittich, eds. (Berkeley: University of California Press, 1978), vol. I, ch. 2., sec. 12, pp. 100–03. ^ Jörg Guido Hülsmann (1995). Mises: The Last Knight of Liberalism (PDF). Ludwig von Mises Institute. pp. 392–96. ISBN 978-1-933550-18-3. Retrieved 30 March 2011. ^ F. A. Hayek, Introduction to Mises's Memoirs, pp. xvi–xvii (1977). ^ Friedrich Hayek, "Socialist Calculation", in Individualism and Economic Order, (University of Chicago Press, 1948). ^ Press release, Nobel Memorial Prize in Economics for 1974. ^ George Ritzer (2009). Contemporary Sociological Theory and Its Classical Roots: The Basics. McGraw-Hill. p. 33. ISBN 978-0-07-340438-7. Retrieved 22 March 2011. ^ Weber, Max The Nature of Social Action, in Runciman, W.G., Weber: Selections in Translation, Cambridge University Press, 1991. p. 7. ^ Fish, Jonathan S. 2005. Defending the Durkheimian Tradition. Religion, Emotion and Morality Aldershot: Ashgate Publishing. ^ Ludwig von Mises, Memoirs, (Mises Institute, Auburn, AL, 2009), p. 88. ^ Quoted in Peter Baehr, "The Grammar of Prudence: Arendt, Jaspers and the Appraisal of Max Weber", in Hannah Arendt in Jerusalem, edited by Steven E. Aschheim (University of California Press, 2001), p. 410. ^ Allan, Kenneth D. (2005). Explorations in Classical Sociological Theory: Seeing the Social World. Pine Forge Press. pp. 150–51. ISBN 978-1-4129-0572-5. ^ Waters & Waters 2015, pp. 1–18. ^ Schumpeter, Joseph (1954). History of Economic Analysis. Oxford University Press. ^ Rothbard, Murray N. (1995). Economic Thought Before Adam Smith. Ludwig von Mises Press. p. 142. ^ Evans, Eric J. (1983). The Forging of the Modern State: Early Industrial Britain, 1783–1870. Longman. p. 114. ISBN 978-0-582-48969-1. ^ Kauder, Emil (1953). "The Retarded Acceptance of the Marginal Utility Theory". Quarterly Journal of Economics. 67 (4): 564–75. doi:10.2307/1883602. JSTOR 1883602. Anker, Guy (1972). Sociologues allemands. Avec le dictionnaire de "l'Ethique protestante et l'esprit du capitalisme" de Max Weber (in French). Neuchâtel: A la Baconnière. Haidenko, Piama; trans. H. Campbell Creighton (1989). "The Sociology of Max Weber". In Kon, Igor (ed.). A History of Classical Sociology. Moscow: Progress Publishers. pp. 255–311. ISBN 978-5-01-001102-4. Archived from the original (DOC, DjVu) on |archive-url= requires |archive-date= (help). Josephson-Storm, Jason (2017). The Myth of Disenchantment: Magic, Modernity, and the Birth of the Human Sciences. University of Chicago Press. ISBN 978-0-226-40336-6. Kolko, Gabriel (1959). "A Critique of Max Weber's Philosophy of History". Ethics. 70 (1): 21–36. doi:10.1086/291239. JSTOR 2379612. Archived from the original on 30 May 2013. Korotayev, Andrey; Malkov, A.; Khaltourina, D. (2006). "Chapter 6: Reconsidering Weber: Literacy and "the Spirit of Capitalism"". Introduction to Social Macrodynamics. Moscow: URSS. ISBN 978-5-484-00414-0. Archived from the original (Google Books) on 18 October 2016. Mitzman, Arthur (1985) . The Iron Cage: An Historical Interpretation of Max Weber. New Brunswick NJ: Transaction Books. ISBN 978-0-87855-984-8. Ritzer, George, ed. (1996). "Sociological Theory". Max Weber (fourth ed.). New York: McGraw-Hill. ISBN 978-0-07-114660-9. Swatos, William H., ed. (1990). Time, Place, and Circumstance: Neo-Weberian Studies in Comparative Religious History. New York: Greenwood Press. ISBN 978-0-313-26892-2. Swedberg, Richard (1998). Max Weber and the Idea of Economic Sociology. Princeton: Princeton University Press. ISBN 978-0-691-07013-1. Swedberg, Richard (October 1999). "Max Weber as an Economist and as a Sociologist". American Journal of Economics and Sociology. 58 (4): 561–82. doi:10.1111/j.1536-7150.1999.tb03385.x. Archived from the original on 21 August 2013. Weber, Marianne (1988) . Max Weber: a Biography. trans. Harry Zohn. New Brunswick: Transaction Books. ISBN 978-0-471-92333-6. Sung Ho Kim. "Max Weber". In Zalta, Edward N. (ed.). Stanford Encyclopedia of Philosophy.